LEXINGTON, Ky. – Buzz Williams' stay here began with a trip to a local hospital for his wife's emergency appendectomy. It ended with the Marquette basketball coach shaking his shoulders, shimmying his hips and pumping a fist at midcourt in Rupp Arena. His team is still dancing by the slimmest of margins, so he danced, too. In between those startling events were the two most tense and dramatic games of the NCAA tournament to date. The great escape Thursday against Davidson was followed by the gritty survival Saturday against Butler. Combined margin of victory: three points. "I shouldn't have done that," Williams said sheepishly about the impromptu dance after his postgame TV interview. "I was really excited. … My wife's been in the hospital over half our stay here. It's been a crazy, crazy four days in Lexington." Williams packed a whole lot of March Madness and medical mayhem into those four days. The Golden Eagles flew into town Tuesday night. Buzz said that by 3 a.m. Wednesday, his wife, Corey Williams, was having her ruptured appendix removed. He was in a largely deserted hospital in the dead of night. Sometime that morning, he left the hospital for his team's closed practice. After that was the open practice at Rupp Arena and an interview session. Williams had his two sons, 9-year-old Calvin and 6-year-old Mason, tagging after him in the arena. You could say he had his hands full. And that was before he had to deal with Davidson or Butler, two of the most dangerous underdogs in recent NCAA tournament history. You know what happened in the Davidson game: Marquette made a stunning succession of clutch 3-point shots, scrambling from five down with 30 seconds to play to win the game on a Vander Blue layup with a single second left. The Eagles doubled down on the drama Saturday night. Trailing by nine in the first half, they out-willed the toughest of opponents down the stretch and then hung on for dear life, 74-72, in an endless final 5.5 seconds. There were five significant developments in that final 5.5 alone. First, while trailing by two, Butler airballed a 3-pointer from the previously hot hand of Rotnei Clarke. And when the Bulldogs then fouled Davante Gardner and he made both free throws for a four-point lead, this seemed over. There was a Golden Eagles goaltend of an Andrew Smith layup off a brilliant, 90-foot inbounds pass by designated home-run passer Emerson Kampen, who just entered the game for the first time. There was a staggering Marquette turnover on the ensuing inbounds play, giving Butler the last shot with 2.4 seconds left – and at that point the Bulldogs' season path, particularly as it related to the Golden Eagles, was almost a palpable presence in the gym. Butler had won three games this season on late hero shots. The first of them was in November in Maui, and the victim was Marquette – Clarke threw in a prayer of a 3-pointer at the buzzer. The Bulldogs called timeout, and Butler coach Brad Stevens went to work on the clipboard drawing up a play. 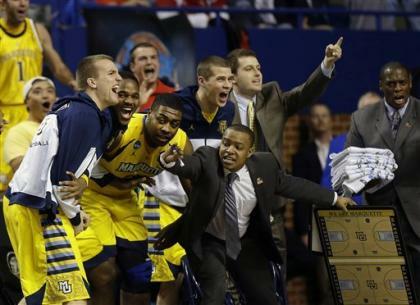 But in the Marquette huddle, Williams went to work, too. He inserted a wrinkle in the way the Eagles had been defending sideline out-of-bounds plays, though he declined to say what that wrinkle was, citing Sweet 16 security concerns. Coming out of the timeout, Butler clearly was flummoxed by what it saw, and the result was something of a train wreck. Stevens was yelling last-second instructions to Clarke, who didn't seem to hear him. He and the other ace shooter on the floor, freshman Kellen Dunham, tried to run off screens but were easily covered. The only available inbounds pass was to center Andrew Smith – a capable perimeter shooter if he has time and space to set his feet and hoist. There was no time, and no space. Fully covered, Smith stumbled and then flung up a no-hope prayer from the top of the key that thudded off the backboard without even threatening to go in. Game over. "We probably didn't have guys that were in the right spots, but that's part of it," Stevens said. "… Ultimately, that one will eat at me, that's for sure." What will eat at Stevens came as sweet relief for the Eagles. "I think God gives you the same test in life, no matter your age, no matter your gender, no matter where you're from," Williams said. "You get the same test over and over. Until you pass it, you're going to keep getting the same test. And tonight, in comparison to Nov. 19, it was the same test and we're thankful that we passed it." Stevens has been lauded plenty for his abilities as a tactician, all of it earned. So has Davidson coach Bob McKillop. Buzz Williams, the slightly loopy, bald-headed guy who sweats through his shirts and wears some crazy stuff on the sideline? Not so much. But it's Williams who advances to a third straight Sweet 16, not the savants from the mid-major schools. Nobody has done that at Marquette since Al McGuire in the early 1970s. "I'm not a genius," Williams said. "I don't want to be a genius. I don't want to be Mr. Tactician. I don't want our program to be known in that regard. I want to be tough." "But in our toughness, that's what's missed. Within that toughness, there's a discipline that is required to have that toughness." In his heart of hearts, Williams wants the recognition for his in-game acumen, too. All coaches do. But for now he'll settle for having at least one more game to coach. During his postgame interview, son Calvin slipped into a front-row seat on one end of the room. Son Mason wandered to the opposite end. They listened to their dad talk, then greeted him in the hallway outside. Buzz gave Mason an intricate handshake, then sent the boys off to the locker room. The team bus had to pick up Corey for the flight home. "She's OK," Williams assured. "She's tougher than any of us." Marquette's players showed plenty of resilience of their own, on a trip that began with an appendectomy and ended with a midcourt jig from a coach who is smarter than he looks, acts or often is given credit for.